By Rev. Greg B. Fernandez Jr.
Greetings to all in the name of our Lord and Savior Jesus Christ. I am glad to present my report to this Annual Conference. The highlights for the Cambodia ministry in 2009 is describe by the word IMPACT which stands for: Impetus, Miscellany, Partnership, Achievements, Challenges, Transitions. Our highest motivation for doing what we did and doing what we do is to please and honor God. What God has called us to do matters most regardless of what others think and do. The high call to glorify God is indeed an impetus regardless of the constraints and challenges of ministry. We thank Him greatly for carrying us through the year 2009. Another impetus for our ministry is our vision. Our ultimate vision for ministry is to see Sustainable, Influential, and Powerful churches impacting lives for time and eternity. Our partners and friends who supported and prayed with us deserve to be called an impetus. What I share in this report was possible because of your partnership with us and the ministry that we do. You are the backbone and the pillar of our ministry here in Cambodia. We are forever grateful for the abundant prayer and the financial support you have extended to us this year. Sharing your resources so that God’s kingdom will expand and grow is indeed an eternal investment. We are indebted to your generous heart and supportive spirit. Your burning passion to support missions keeps us excited, motivated, and inspired. We sincerely thank you for your partnership making it possible for us to continue our ministry in Cambodia. Historic marriages happened in the Wesleyan Church of Cambodia this year. Pastor Vandy Hourng, the new elected WBI president, married Rolitess Galam from the Philippines in October. Two months later, Channy Kong, one of our WBI staff and the daughter of the District Superintendent, married Jeff Rasmussen from Oregon, USA. Marriages between Cambodian nationals and foreigners are very costly and complicated. After several months of paper works both marriages received approval from the Cambodian government. It was a relief for both and everyone concerned. Here is a picture of the whole Cambodian Wesleyan church in a statistical form. You will notice here that membership is not listed. I think that telling you how many people are really worshiping every Sunday is more realistic than showing you how many members we have in the membership role. Excluding children, our 30 churches have a total of 560 worshipers every Sunday and average of about 18 people every church. While these worshipers are all members, we have more members in our list than the regular worship attendees. The Wesleyan Church of Cambodia is not far behind in comparison with most churches in Cambodia. While a few have hundreds attendance in worship, the majority are small. In 2009, I taught more than 100 hours at the Wesleyan Bible Institute, conducted all WBI staff meeting; spoke during WBI prayer meeting and WBI chapel services. At the national church level, I attended all the DBA meetings, visited 29 churches several times, and Preached 10 times to over 1, 500 people mostly non-Christians with only 10 seekers of salvation. While it is easy to have people raise their hands or to come to the altar to receive Christ, more often than not it is not the best way to determine whether a person is saved. Last year, we hosted a total of 8 different teams and individuals with a total of 50 people from KCC, GP headquarter, Brookings Wesleyan Church, World Impact (Indiana Wesleyan University), Redfield Wesleyan Church, Mitchell Wesleyan Church, Brevard Community Church, and 3 guests from the Philippine Church. Resie, my wife is an excellent partner in ministry. She has done a great administrative work for the national church and WBI. She taught courses also at WBI that are very inspiring. I thank God for her partnership and the work that she does. She keeps me on track every time I go off the track. She is currently the WBI registrar and the missions’ treasurer and bookkeeper. Not everyone wants to go to school 7 days a week but for Aleeyah, that’s what she thinks school should be. At 4 years and 8 months old, our first daughter, Aleeyah Charis, goes to pre-Kindergarten School. She is excited about school every day and questions why her school closes on Saturdays and Sundays. Esher is growing too and she loves to play, sing, and talk. Both Aleeyah and Esher are learning to speak Khmer. The DBA made plans for income generating projects to augment the ongoing deficit of funding. Project by the Wesleyan Church of the Philippines. Fund not yet available. To sale this church property in order to fix a current problem is not the main motivation but to prepare for the future. In fact, the selling the property seems to be the best source to fund the income generating projects mentioned above. The selling of church property is not to be spent but to be invested to generate more income for kingdom expansion. The Greatest achievement that inspired us the beginning of the year was the completion of the new WBI facility. 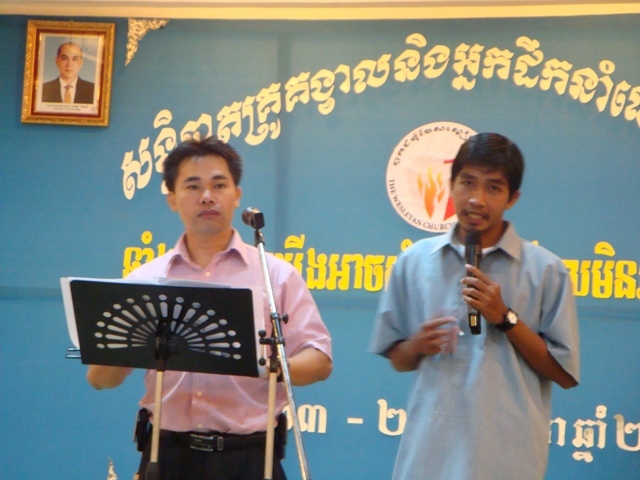 The 10th of January 2009 marked a wonderful celebration of God’s faithfulness and provision to the Cambodia ministry when the new building of the Wesleyan Bible Institute (WBI) was dedicated to the glory of God. After 6 years of praying, planning, and giving, the WBI building stand tall as a symbol of partnership between different supporters and the Cambodian ministry towards the fulfillment of a vision to train future pastors and leaders for the Cambodian church. 12 representatives from the two major donors for the WBI facility, 3 from Kentwood Community Church (KCC), and 9 from the Dakota District, were present during the event. KCC was the major financial force in the history of the new campus and facility. Along with KCC and other individual donors and churches, the Dakota District also plays a major financial role for the new facility. More people will know Christ when more ministers will share Christ because more are trained as they are called by Christ. Four Churches were planted in 2009 with an average attendance of 30 adult and young people. While several churches decline in membership, new churches were planted, and others grew. A fire tragedy struck the family of pastor Sideth while he was at the hospital being treated for serious illness. The family lost their home and almost everything they owned. A total of $30,000 turned to ashes in this tragedy. But thanks to the Generous support of KCC and GP to help the family start a new beginning. In July 2009, we lost one of our most dedicated and faithful laymen in Cambodia. Lookru Moich had a motorcycle accident in April which led to a major surgery in his head. After three months of battle with his injury, he went to be with the Lord whom he faithfully serves on July 23, 5 o'clock in the morning. His ministerial legacy is seen in the two churches that he has pioneered and also to his active involvement in the ministry of the local church. The church in Kratie has been shut down by government authorities in October 13, 2009. The reasons are complex but God is turning things around to our advantage. The paper work to reopen the church is still on hold by the Ministry of Cults and Religion. The processing of the document is taking too long due to the involvement of some political figure with high profiles. A military General and a colonel from the Royal Cambodian Arm Forces though are helping us. It is a sad scenario that one of our pastors and one of our students faced a disciplinary action due to moral indecency. This is the first time in the history of the Wesleyan Church of Cambodia this one has occurred. Despite this, the church is slowly moving triumphantly. The challenge of finances is endless but the source is ceaseless—it never runs out. Such is the situation here in the field. The National Ministry Shares (NMS), a fund coming from the US churches and individuals, for the Cambodian national church has not always been enough to cover the pastors’ monthly support and national office expenses. There is a substantial drop of donation for this budget that will allow pastor to get their support less than half of what they normally receive in a monthly basis if this problem will not be solve in 6 months. This is a very alarming scenario because not one local church in Cambodia Wesleyan Church can afford to support its own pastor. Teaching church members on the subject of stewardship has always been difficult. But however difficult it may seem, there is no other alternative path if we are to build sustainable churches. Our personal ministry budget towards the end of 2009 also dropped to one third of what is actually needed. It takes a miracle to survive the year 2010, but the miracle Worker is not limited with the financial crises. Our hopes never diminish because the best is yet to come! Robert Schuller put it well enough, “Tough times never last, but tough people do.” We are trying to be tough people during these tough times. We are all aware that transition is the only constant experience in life. We transition from one place or state to another. Transition is indispensable and inevitable. From cradle to the grave, from womb to tomb, transition is constant. Perhaps the final transition is the transition from death to eternity. Although transition creates discomfort, it brings new challenges. It leads to new opportunities. It provides growth. Here in the field, several transitions have transpired that underline new challenges, opportunities, and growth. Missionaries come and go and go and come, but the field remains. It is therefore a must to train the locals to lead their own. In 2009 the time has come that a Cambodian national has to take the full leadership responsibility of the Wesleyan Bible Institute (WBI). With my recommendation, Pastor Vandy Hourng was nominated and elected during the pioneer district conference on April 24, 2009, and was installed on September 4, 2009, being the first Cambodian president to ever lead WBI. Pastor Vandy Hourng is one of the first graduates at WBI in 2003, and one of the first Cambodians to earned Bachelor of Theology degree at Rosales Wesleyan Bible College, Philippines. He brings into the school a rich pastoral experience and theological education. While, we trust Cambodians to lead the church, they also need to trust the missionaries if we are to work as a team. I used to be the WBI president but I now oversee the national church. Because we have 30 churches total, it is quite a challenge to supervise these churches and mentor pastors. While I remain as the WBI Academic Dean and teach one course a semester at WBI, our main focus of ministry is to the National Church. In 2009, I also started to revise and rewrite the Discipline of the Wesleyan Church of Cambodia hoping to complete in 2010. The DBA has approved a resolution last year allowing ministers to work bi-vocationally to augment their financial difficulty. This policy is under trial for one year and will be evaluated during the 2010 District Conference. It is too early to tell whether or not the bi-vocational minister has more positive results. In 2009, 6 WBI students left for their ministry assignment. WBI was their home for three years. The theoretical side of pastoral preparation has been completed, but the real test of learning is not in the classroom but in the field. The field is where they are truly shaped and molded. Our six students officially began their ministry on October 12. It will be a one year internship, and if all goes well, they will graduate in September 2010. What lies beyond the horizon is unclear but the place where we want to go is clear. The course is set and the journey continues. The path is not always smooth. There are valleys to walk, mountains to climb, and rivers to cross. With God leading us there is no reason to quit and with you partnering with us there is no reason to give up! Together, we can accomplish the impossible!